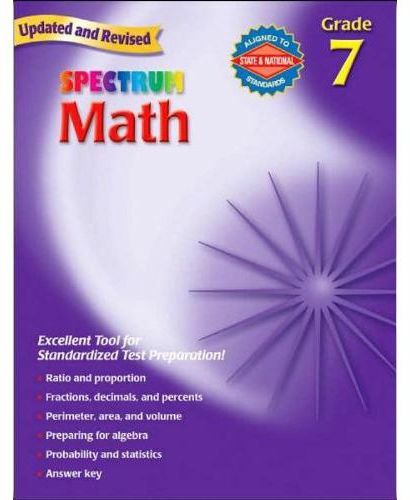 Our proven Spectrum Math grade 7 workbook features 192 pages of drills and practice in math fundamentals. Recently updated to current national math and testing standards. This workbook for children ages 12 to 13 uses everyday math applications to teach basic skills. Math skills include: ?Ratio and proportion ?Fractions, decimals, and percent's ?Calculating interest ?Perimeter, area, and volume ?Algebra ?Geometry ?Probability and statistics Our best-selling Spectrum Math series features age-appropriate workbooks for Preschool to grade 8. Developed with the latest standards-based teaching methods that provide targeted practice in math fundamentals to ensure successful learning.